No Wasted Time: Let us do the work for you. We can quickly find reputable remodeling companies in your area. No Uninformed Decisions: You will receive access to remodeling company reviews. 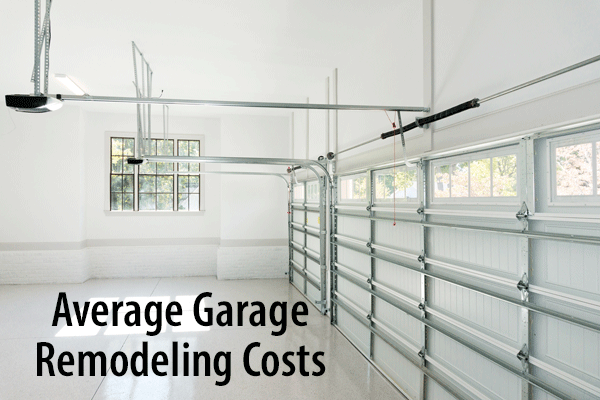 How Much Does it Cost to Remodel or Convert a Garage? Most homeowners will spend between $6,000 and $19,000 to have their garage remodeled by a professional. The national average reported cost is about $12,000. The minimum cost a homeowner paid is around $2,000 while the maximum reported cost is in the ballpark of $35,000. Thinking of taking on a garage remodeling project? We fully understand what a daunting task this can be! There are many difficult decision to be made including design choices and choosing the right contractor. The best thing you can do to prepare yourself is to be fully informed and research your contractor choices. This guide will help answer some of those difficult garage remodeling questions right now! We can also quickly connect you to licensed and insured garage remodeling contractors in your area TODAY! Most people think of the garage as simply a place to park their car, store the lawnmower and hang their tools. But when you’re in need of more living space, you might want to think twice about that. Remodeling the garage is more affordable than building an addition because the roof and walls are already in place. Some people remodel a garage to use it as an extra bedroom or to convert the garage to an apartment. Others create an office or second living room. However, some people simply remodel the garage to make it a better, more functional garage. They might add drywall, organizing features like garage cabinets, shelves and a work bench. See our article on the labor cost to hang and finish drywall. The price of a garage remodel depends on what’s being done. Obviously, turning the garage into a basic living room or office is more affordable than turning it into an in-law suite with a kitchenette and bathroom. The average cost is about $10,000 to $15,000. A garage remodel intended simply to improve the garage (and still use it as a garage) can usually be done for about $1,000 to $5,000. This type of remodel can be a DIY garage conversion for the handyman as it usually does not require permits. A basic conversion to an office or bedroom usually costs about $5,000 to $10,000. Tasks include drywalling off the door and the rest of the room, adding dropped ceilings, and adding heating and cooling. If there’s no window in the garage, you’ll have to cut one. Building codes require living spaces to have a window that is large enough for a person to crawl through in an emergency. Having a window cut and installed might add another $1,000 or so to the project. Anytime plumbing is involved, the price goes up. Converting the garage into a bedroom with a bathroom is likely to cost $10,000 to $15,000. Converting the space into an in-law apartment with a kitchen and bath is likely to cost about $15,000 to $25,000. 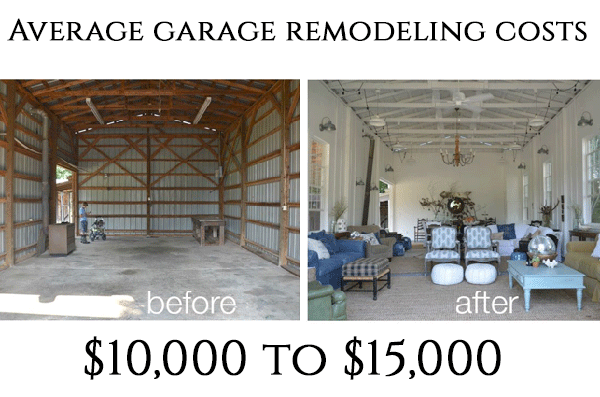 Check out this before and after video of a simple garage renovation. What a diiference! A few words of caution: Converting your garage into living space can actually lower the value of your home. For many buyers, especially those in colder climates, a garage is an important selling feature. That doesn’t mean you shouldn’t go ahead with the conversion if it makes sense for your family; just have realistic expectations about the impact on value. As a general rule, experts advise against a garage remodel if you expect to be putting the house on the market within the next few years. The exception to this rule may be if you plan to convert your garage to a rental unit. This could potentially add value to your home depending on the market you are in. Some states are encouraging its residents to convert their garages to rental space as it creates more affordable living opportunities. California has passed a state law that will make it easier for homeowners to build and permit their garage transformation in an effort to lower skyrocketing rental prices. Look for a contractor who specializes in garage remodels - or at least one who has experience remodeling garages. Ask to see pictures of previous jobs such as the before and after garage conversion picture shown here. A good contractor should be able to show you garage conversion designs and you can also get some inspiration from looking online at garage remodeling ideas. Remodeling a garage is different than remodeling other areas of the home, and it helps to have a contractor who understands that. Get multiple quotes to compare prices before choosing a contractor. But keep in mind that the cheapest contractor is not always the best. Typically, it’s a good idea to throw out any quotes that seem suspiciously high or low. Do some background research on any company you’re thinking of hiring. Ask for references - and call them. Check the company’s record with consumer organizations like the Better Business Bureau or Angie’s List. You can call the local building department, too. Make sure the company you hire is licensed and insured. Ask for proof. A company that is not licensed is not likely to be reputable - they’re breaking the law. If the company is not insured, you could be financially responsible for any accidents that occur on your property while construction is underway. Ask for details - in writing. Professional garage remodel contractors will provide you a start date and an end date for the project, as well as a detailed breakdown of all anticipated expenses, including materials and labor. Check out this sample remodeling contract. How Much Does It Cost To Renovate Or Convert a Garage? Do You Need a Garage Remodeling Pro Near You?